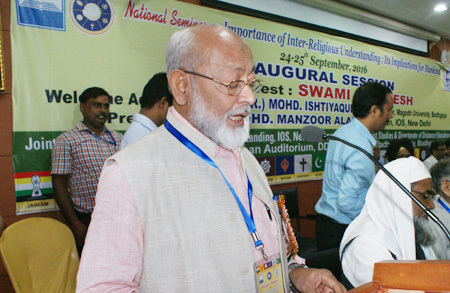 A two-day national seminar on “Importance of Inter-Religious Understanding: Its Implications for Mankind” jointly organised by Forum for Inter-religious Understanding, Institute of Objective Studies (IOS) and Deptt. of Buddhist Studies & Directorate of Distance Education, Magadh University in Bodhgaya, concluded on September 25, 2016. The deliberations that started on September 24 saw the convergence of religious leaders from six main religions who unequivocally underscored the need for the creation of a congenial atmosphere for peaceful co-existence, harmony, mutual respect and tolerance. 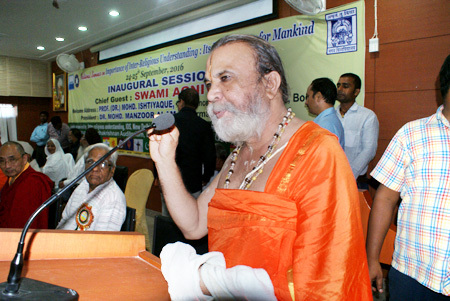 The inaugural session was opened by President of Bandhua Mukti Morcha and a prominent Arya Samaj leader, Swami Agnivesh. In his inaugural speech, he held that God is one, but He is called by several names. We fight among ourselves because we err in understanding Him. He said that the cause of the problem of misunderstanding among different religions were the rituals and ceremonies that were performed in the name of religion. All of us are creatures of the same God, yet we nurture the idea of being separate entities. Nobody knew where this idea came from, he wondered. He maintained that while Gautam Buddha spread the message of love and compassion, Islam praised God as “Rabbal Alameen” (Nurturer of the worlds). Though our earth is equal to the minutest part of a rice grain in the universe, we cannot remain united. 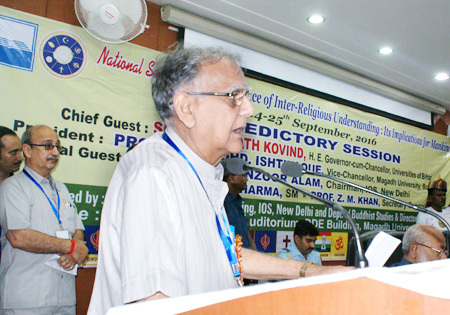 Laying emphasis on the unity of all religions, he said that it was resolved to form a Dharma Sansad (religious parliament) seven years ago to foster inter-religious unity. Commenting on the evils that were plaguing our society, he observed that consumption of liquor was one of them, leading to the disintegration of social order. He called for a united fight against liquor consumption and freeing society from this scourge. Praising Bihar Chief Minister, Nitish Kumar for enforcing prohibition in the state from April 1 last, he termed it as a positive and courageous step. He said that in Islam, drinking is assumed as the fountain-head of all evil. Condemning gender bias he said that we claim to be a predominantly religious country, but sons are always preferred over daughters. 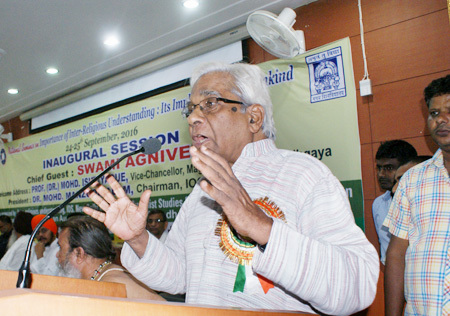 He deplored that cases of lakhs of female foeticide were reported every year in the country. Underlining the need for inter-caste marriage, he suggested that inter-caste marriage fairs be organised every year to put an effective curb on casteism. 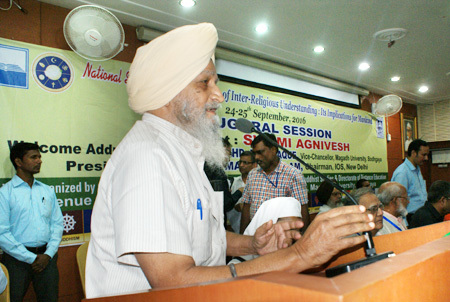 He also pleaded for a common minimum programme for religions to follow. The vice-chancellor of Magadh University, Prof. Md. Ishtiyaq, in his welcome address held that today’s world was faced with problems like communalism, nepotism, intolerance, yawning gap between poverty and wealth, etc. 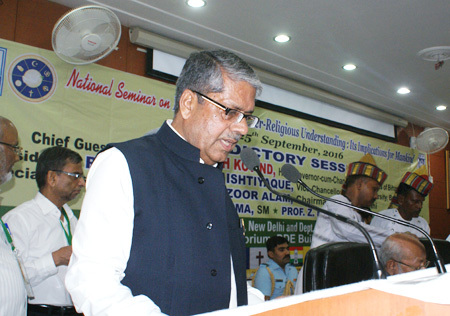 It was against this backdrop that a two-day national seminar was planned to indentify these problems and seek their solution in a religious perspective. He was elated that the seminar was deliberating on such a serious issue in the land of Mahatma Buddha who spread the message of peace, brotherhood, goodwill, forbearance and cooperation. He said that it was prayer that was essential for the peace of mind. Lauding the role of the Institute of Objective Studies in cherishing human values and finding ways of virtue, he said that this was the first partnership of the university with the IOS. India was a country where many religions were flourishing without hindrance and we were duty bound to take the spirit of mutual understanding among various religions further. He lamented that though the Indian Constitution had guaranteed the right to equality and freedom to the citizens of the country in order to strengthen national integration, certain vested interests were busy working against brotherhood and striking at social harmony. Holding that social harmony pre-supposed prosperity, he said that religious heads had given a fillip to peace and goodwill. He expressed the confidence that the confluence of religious leaders would herald a new dawn. In his presidential remarks, the Chairman of IOS, Dr. Mohammad Manzoor Alam informed that the institute was completing 30 years of its existence. Associating himself with the views of Swami Agnivesh on prohibition, he insisted that the All India Milli Council had discussed the issue in detail at its Bengaluru session where the Swami was also present. He opined that while intellectuals conceived ideas, it was the universities which were tasked with reaching them to the common people. “We have one of the finest Constitutions of the world, but it is not being implemented in accordance with its spirit. Similarly, laws exist, but are not being properly enforced to maintain law and order”, he regretted. He hoped that the clouds forming at the national seminar would rain over the world spreading the message of tolerance, goodwill, love and respect for other’s religions. 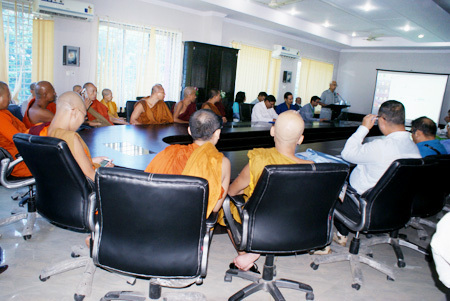 In order to perpetuate the memory of the seminar, he urged the vice-chancellor to plant a sapling on the university campus. He also suggested the setting up of a forum for religious understanding for promoting mutual goodwill. The seminar was formally opened with the lighting of a lamp by all the religious heads present on the occasion. Addressing the delegates, Acharya Dr Lokesh Muni of the Ahimsa Vishwa Bharti, New Delhi, pointed out that similar to different types of pollution, the ideological pollution called terrorism, too, had taken in its stride the areas stretching from Syria to Afghanistan. Religion only strengthened bonds and never broke. He felt it strongly that the country would not transform unless the outlook of society underwent a change. In a democracy, diversity of views was essential for development, he said. 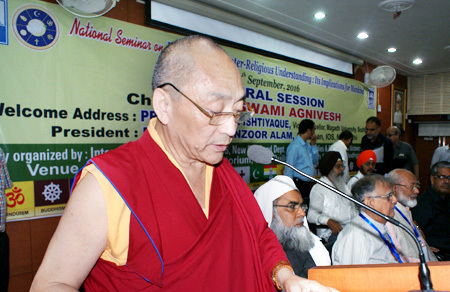 Vice-chancellor of the Central University of Tibetan Studies, Sarnath, Varanasi, Prof. GN Samten, held that Indian culture was the oldest and the concept of respect for all religions was inherent in it. This offered an example for the rest of the world. The languages of the religions might be different, but the basic idea remained the same. What was needed most was to promote friendship, brotherhood and love in temples, mosques, churches and gurudwaras, he remarked. Former chairman of PUCL, Bihar, Father Philip Manthra said that a man commanded respect since his birth which continued till death. This respect had been outlined by our Constitution. Since all religions stood for human welfare, Bodhgaya should serve as a starting point, he said. Jain Sadhvi, Veerayatan, Rajgir, Upadhyay Sadhvi Yashaji called for inter-religious efforts to mould people towards tolerance. She said that no religion was ill-disposed to other faiths and hence, we should take forward the divinity of religions by treading the path of compassion, love, fraternity and harmony. The President, All India Ramacharya Mantralaya Vishnupad, Gaya, Pandit Ramacharya defended the Sanatan Dharma by saying that it did not hold a critical view of other religions. Referring to the custom of pind daan (for the peace of ancestors’ souls), he said that those who converged on Gaya for pind daan also contributed to the local economy. Local population benefited from the pilgrims who undertook the journey to Gaya every year. 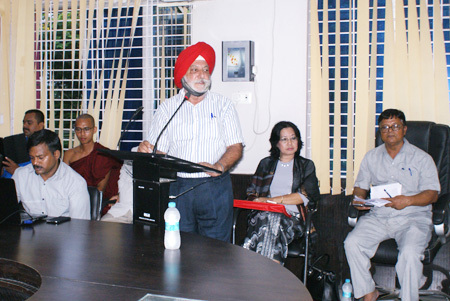 Former professor, department of religious studies, Punjab University, Chandigarh, Dr. BS Siddhu emphasised that Guru Nanak Dev, Mahatma Buddha, Swami Vivekananda and Dr Mohammad Iqbal stood for unity in diversity. Lt. Gen. RK Sharma, army headquarters, New Delhi, held that goal of all the religions was one, but the ways differed. We should find a common path. He said that like other religions, army was also a religion where followers of different religions worked together as a single family. Defending the country was their religious duty as for soldiers country came first and other things later. He said that the military was the only organisation where all-religion prayers were conducted and soldiers professing different faiths visited them. He suggested that all-religion places should be constructed by religious leaders unitedly in order to promote tolerance among themselves. He also said that the news channels should be asked to compulsorily show video clips on religious tolerance. He felt that the media could play a constructive role in nurturing the idea of tolerance and communal harmony. President, Gurudwara Management Committees, Gaya, Sardar Karnail Singh also stressed the need of unity among all the religions. The chancellor of the Integral University and Principal, Nadwatul Ulema, Lucknow, Maulana Saeedur Rahman Azmi, observed that Allah created man so that he could benefit from the earth and extend those benefits to others. He divided people into different communities, so that they could recognise and love each other. Referring to the Qur’an, he said that the greatest among the human beings was one who recognised his Creator. Man was the most respectable among all creatures. All of us were one because we had a common mother and father. The solution to the problems facing us today lay in coming closer to each other. We must learn to trust each other, he added. The Secretary General, IOS, Prof. ZM Khan, while outlining the activities of the Institute, said that it was engaged in formulating plans for the future. This included seminal research on epistemology and uplift of weaker sections, especially Muslims. He maintained that the Institute also commissioned researchers for conducting surveys on various subjects. Besides, the Institute published books on various topics. More than 300 books had been published by the Institute. 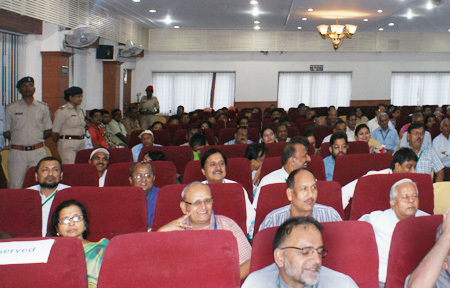 Seminars and symposia on burning topics were regularly organised by the Institute. Three books – Introduction to Sociology: An Islamic Perspective, Sociology in Islamic Perspective: Selected Readings written by Prof. AR Momin and Shiksha Dwara Muslamanon ka Sashaktikaran by Prof. Akhtar Siddiqui, published by the IOS, were released on the occasion. A vote of thanks was proposed by dean, faculty of science, Magadh University, Prof. NK Shastree. The first session was devoted to “Hinduism, Islam, Buddhism, Christianity, Jainism and Sikhism.” This session was chaired by Prof. Mohsin Usmani Nadwi, former dean, English and Foreign Languages University, Hyderabad and Prof. DA Gangadhar, professor and former head, deptt. of philosophy and religion, Banaras Hindu University, Varanasi. While Dr Rajeev Ranjan Sinha, former head, deptt. 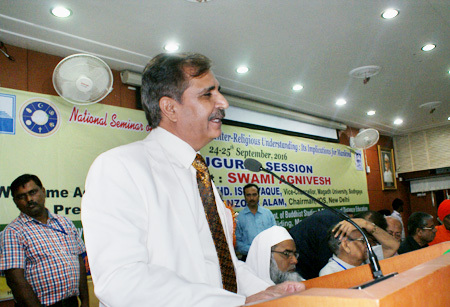 of Sanskrit, Sampurnanand Sanskrit University, Varanasi, spoke on Hinduism, secretary-general Islamic Fiqh Academy, New Delhi, Maulana Khalid Saifullah Rahmani, explained the tenets of Islam; Dr. AAB Gyaneshwar, chief monk, Kushinagar Myanmar Temple, UP and Dr. U Kundala of Nalanda University enlightened the audience on Buddhism. While Father U Lawrence, president, Jeevan Sangam, Bodhgaya, elaborated on Christianity and Prof. NK Shastree, spoke on Jainism, Col. Dalvinder Singh Grewal, Desh Bhagat University, Punjab, spoke on Sikhism. 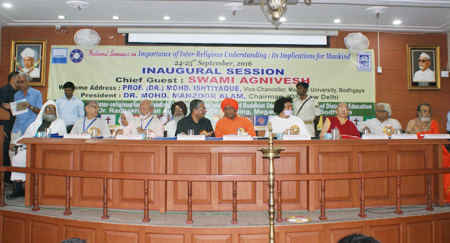 The second session on “Inter-religious Understanding” presided over by Swami Agnivesh, focused on religious understanding. 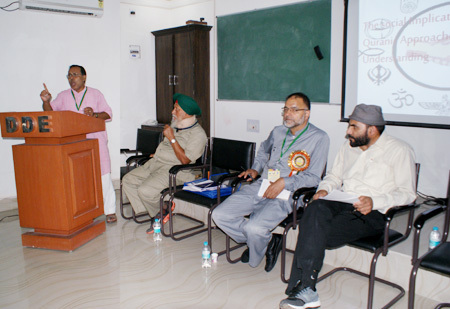 While Col. Dalvinder Singh Grewal, Desh Bhagat University, Punjab, presented a paper on “A Study into development of inter-faith dialogue by Guru Nanak”, Founder Director, Institute of Harmony and Peace Studies, New Delhi, Dr. MD Thomas, spoke on “Golden Rule – A Shared Culture of Ethics”. 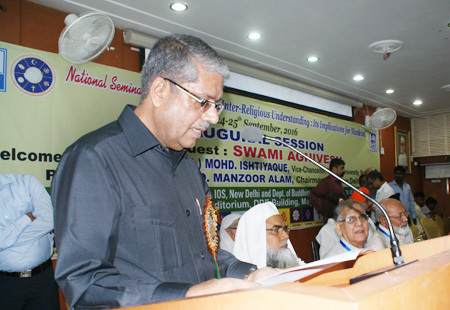 Prof. Mohsin Usmani Nadwi, presented a paper on “Musalman Aur Hindu Mazhab ki Mutaleyati Riwayat”. Secretary, International Buddhist Council of Bodhgaya, Kiran Lama and Secretary, Inter-faith Forum, Bodhgaya, Dr. Azmat Hussain also explained their viewpoints. The fourth session on the second day focused on the “Prospects of Inter-religious Understanding and the Indian Constitution”. 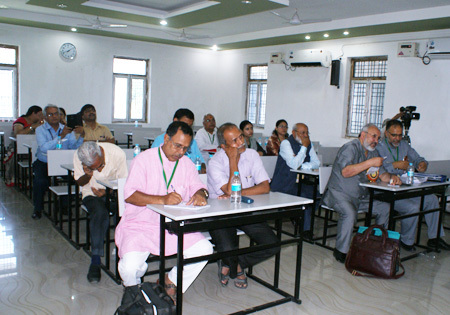 It was chaired by the vice- chancellor, Central University of Kashmir, Prof. Mehrajuddin Mir. While Dr Mukesh Kumar presented his paper on “Religiosity and Indian Constitution”, Dr. Saswati Mutsuddy of the University of Kolkata and Dr. Bela Bhattacharya of Kolkata spoke on “The Glorious Buddhist Women of Rajgaha”. Dr. Manish Sinha of the deptt. of History, Magadh University and Dr. Tarika Kumari, Rashtriya Sanskrit Sansthan concentrated on “Mahila Mukti Ke Prerna Srot Buddha: Ek Drishti.” Dr. Arvind Bhattacharya from Kolkata also spoke on the theme. The fifth session focused on “Inter-faith Dialogue and Human Rights Violation” was presided over by Lt. General RK Sharma. Speakers in the session included: Prof. DA Gangadhar, who presented a paper on “Inter-religious Understanding and Dialogue for Peace”, Dr. Aquil Ahmad, asstt. 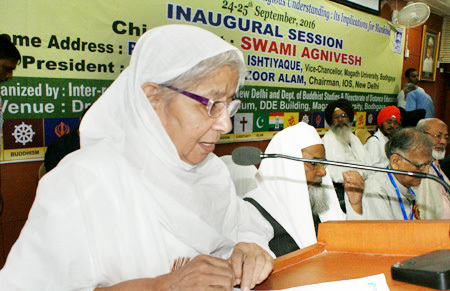 professor, department of philosophy, AMU, Aligarh, who presented a paper on “Engaging Youth in Inter-faith Understanding and Communal Harmony”, Dr. Saw. Htutu Sandar (Myanmar), deptt. 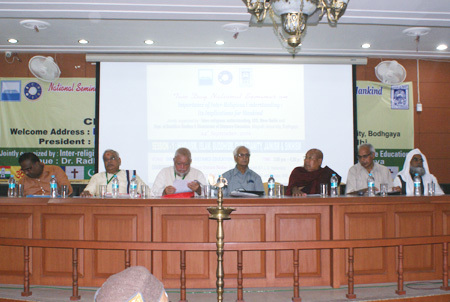 of Buddhist Studies, Magadh University, who presented a paper on “My Experiences with Universal Brotherhood”, Dr. Buddhadev Bhattacharya, Nalanda University presented a paper on “Inter-religious Dialogue and Indian Cultural Legacy of Buddhism. Dr. SK Jain, deptt. 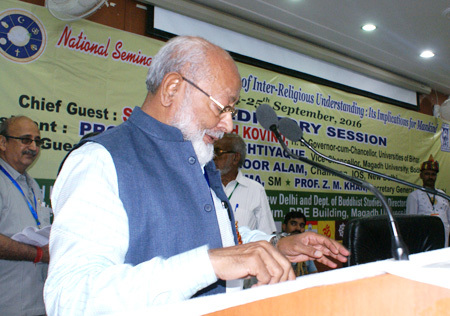 of religion, BHU, Varanasi and Dr. SB Singh, NavNalanda Mahavihara, Nalanda, also spoke on the theme. 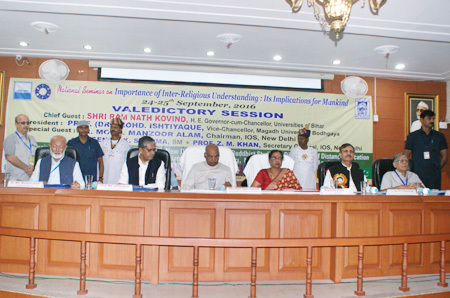 The seventh session was devoted to “Need for Inter-religious Understanding”. 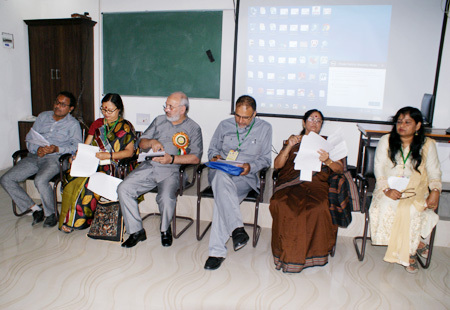 This was chaired by Prof. Madhumita Chattopadhyay, Jadavpur university, Kolkata. 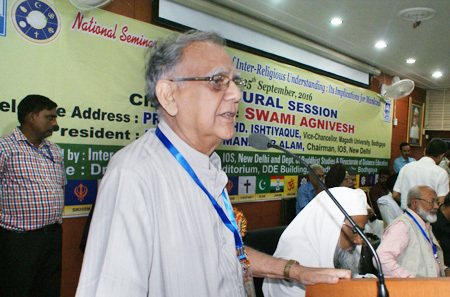 Dr. Sibtosh Bandyopadhyay, professor of political science, Vivekananda Mahavidyalaya, Hooghly, presented a paper on “Deepening democracy are the most essential criterion for inter-religious understanding and promoting humanity”, Dr. Nripendra Kumar Srivastava, deptt. of history, Magadh University presented a paper on “Inter-religious Understanding in Practice: A study of Akbar’s policy of sulh-i-kul”. Prof. Ishteyaq Danish and Prof. ZM Khan also spoke on the theme. The eighth session was devoted to “Global Harmony”. Prof. NK Shastree was in the chair with Dr. Pravat Kumar Dhal, Member, Global Harmony Association and head of the department of education, Magadh University, presenting his paper on the topic. 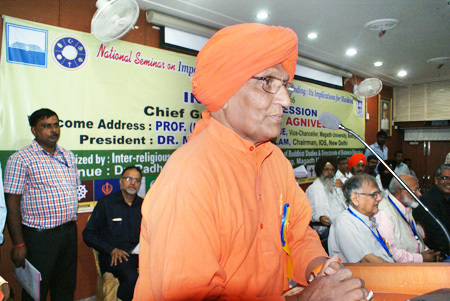 Prof. Manoranjan K Singh, HoD, deptt. 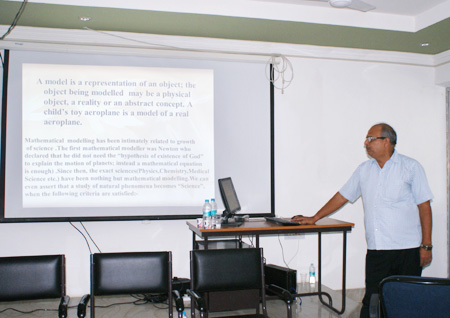 of mathematics, Magadh University also spoke on the theme. The ninth session was devoted to “International Fraternity”. 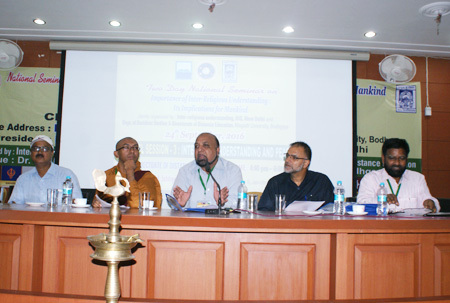 Prof. Bela Bhattacharya, University of Kolkata presided over the session. The speakers in the session included: Phrawiwat Hongsen (Thailand), Ms. Truong Thi Ngoc Anh, Vietnamese scholar, presented a paper on “Importance of Inter-religious Understanding: Its implications for mankind”, Dr. Vishwajit Kumar NavNalanda Mahavihara, Nalanda, presented a paper on “Dharm aur uska swaroop: Dhampad ke vishes paripekshya mein”. Dr. RKP Singh, NavNalanda Mahavihara, Nalanda also spoke on this theme. 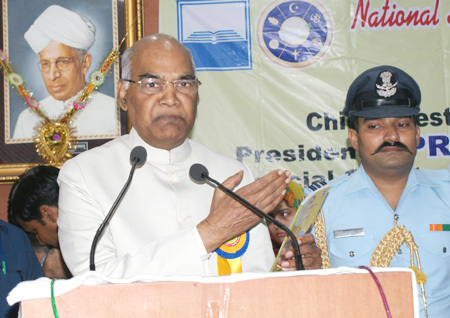 The valedictory session was addressed by the governor of Bihar and the chancellor of the university, Ram Nath Kovind as chief guest. In his address, the governor made special mention of the booklet titled “Messages of Peace”, brought out by the Magadh University. He said that the letter ‘I’ was especially important because it was common to all the six religions – Hinduism, Jainism, Buddhism, Sikhism, Islam and Christianity, mentioned in the booklet. He insisted that ‘I’ symbolised unity among all these religions which was so essential for national integration. One character of each of all religions together thus made “INDIAN”. He cautioned people against religious radicalism which posed a danger to the unity of the country. Referring to the Right to Religious Freedom enshrined in the Indian Constitution, he said that Dr. BR Ambedkar wanted religion to work as science did. Knowledge could best be acquired by following religion and propriety. Commenting on Articles 25, 26, 27 and 28 of the Constitution, he explained that the state was secular and there would be no discrimination against anybody on the basis of caste and creed. Even parliament had been barred from imposing a particular religion on the people. Quoting the noted Hindi poet, Ramdhari Singh Dinkar, he said that Indian culture was not like grains collected by ants, but it was like honey collected by bees which benefited all. He noted that unity in diversity was the hallmark of India’s strength. Whether they were Krishna, Jesus Christ or the Prophet (PBUH), all of them possessed divinity. 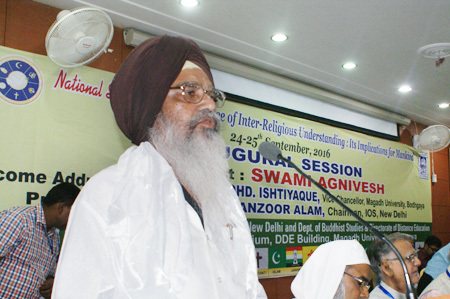 He pointed out that the views expressed at the seminar were not new, as the saints of Hindu Nirguna stream and sufi saints had already spread the message of religious tolerance, affection and brotherhood. But, what was needed was to create understanding and establish dialogue between different sects, he said. He made a plea for dialogue not only between two religions, but also among all religions. The vice-chancellor, Prof. Md. Ishtiyaq, hoped that the views expressed in the seminar would go a long way in taking the message of peace, goodwill and brotherhood to every nook and corner of the country. He informed that a total of 50 research papers on nine different topics were presented by the scholars at the two-day national seminar. 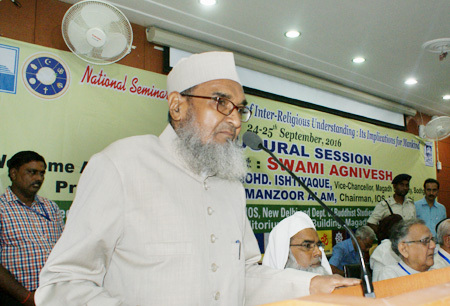 IOS Chairman Dr. Mohammad Manzoor Alam, while spelling out the purpose of the seminar, said that religious leaders, intellectuals and scholars had gathered to think over religious intolerance and confrontation in society and find ways to put a stop to them. He asked them to form a strong chain, the links of which must be so strong as not to let the country weaken. 1. Keeping in view the successful handling of the subject and the display of organisational capabilities of involved organisations, it is felt that more efforts should be made to continue with this practice on mutually-agreed terms by the parties. 2. The Institute of Objective Studies and the Magadh University may mutually agree to cooperate in granting funds to research/survey projects, scholarships and exchange of scholars on the basis of prescribed terms and conditions. 3. This conference emphatically proposes to keep women and youth studies in the priority areas of research design undertaken by both the parties. These bodies would cooperate in mutually agreed areas.